Nashville’s cool factor is on the rise. Lisa Felepchuk uncovers a unique boutique property that’s pushing design boundaries. Published in S/ magazine, Spring 2015. 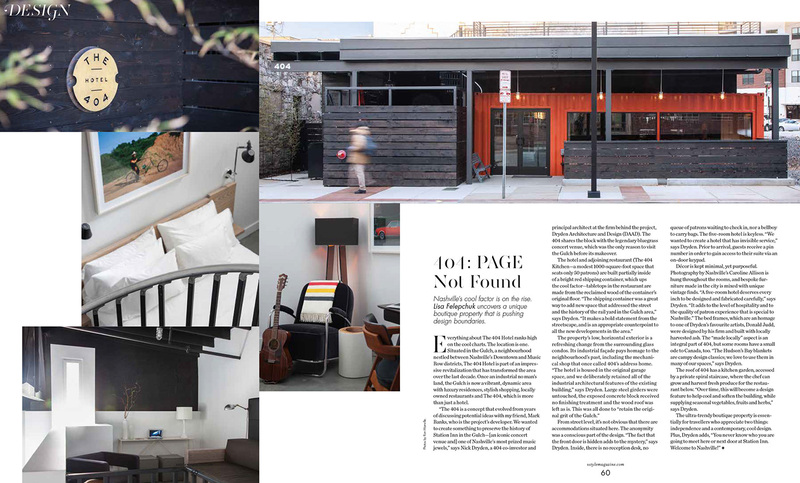 Everything about The 404 Hotel ranks high on the cool charts. The location is one. Situated in the Gulch, a neighbourhood nestled between Nashville’s Downtown and Music Row districts, The 404 is part of an impressive revitalization that has transformed the area over the last decade. Once an industrial no man’s land, the Gulch is now a vibrant, dynamic area with luxury residences, stylish shopping, locally owned restaurants. “The 404 is a concept that evolved from years of discussing potential ideas with my friend, Mark Banks, who is the project’s developer. We wanted to create something to preserve the history of Station Inn in the Gulch—[an iconic concert venue and] one of Nashville’s most prized music jewels,” says Nick Dryden, a 404 co-investor and principal architect at the firm behind the project, Dryden Architecture and Design (DAAD). The 404 shares the block with the legendary bluegrass concert venue, which was the only reason to visit the Gulch before its makeover. From street level, it’s not obvious that there are accommodations situated here. The anonymity was a conscious part of the design. “The fact that the front door is hidden adds to the mystery,” says Dryden. Inside, there is no reception desk, no queue of patrons waiting to check in, nor a bellboy to carry bags. The five-room hotel is keyless. “We wanted to create a hotel that has invisible service,” says Dryden. Prior to arrival, guests receive a pin number in order to gain access to their suite via an on-door keypad. Décor is kept minimal, yet purposeful. Photography by Nashville’s Caroline Allison is hung throughout the rooms, and bespoke furniture made in the city is mixed with unique vintage finds. “A five-room hotel deserves every inch to be designed and fabricated carefully,” says Dryden. “It adds to the level of hospitality and to the quality of patron experience that is special to Nashville.” The bed frames, which are an homage to one of Dryden’s favourite artists, Donald Judd, were designed by his firm and built with locally harvested ash. The “made locally” aspect is an integral part of 404, but some rooms have a small ode to Canada, too. “The Hudson’s Bay blankets are campy design classics; we love to use them in many of our spaces,” says Dryden. The roof of 404 has a kitchen garden, accessed by a private spiral staircase, where the chef can grow and harvest fresh produce for the restaurant below. “Over time, this will become a design feature to help cool and soften the building, while supplying seasonal vegetables, fruits and herbs,” says Dryden.